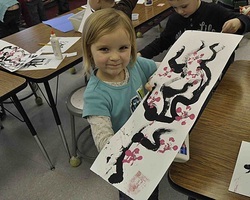 Kindergarteners read a Japanese folk tale entitled "Under The Cherry Blossom Tree". They then used black paint to create branches and printed pink blossoms onto the branches using a tennis ball canister. Finally the kindergarteners looked at Japanese symbols and chose one symbol to make into a stamp and print onto their paintings. 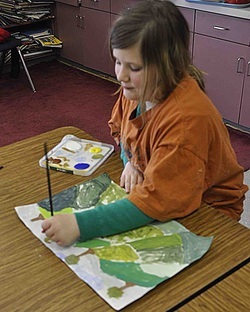 The third graders focused on tints in this lesson. They recreated the feel of water by tinting blue paint and then once the paint was dry they drew sea creatures with oil pastels. 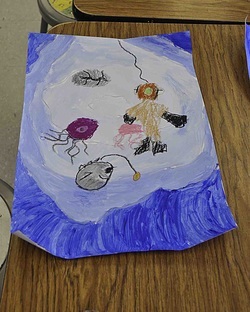 The kindergarteners explored the idea of movement in art. They built 3-dimensional bugs using foam shapes and then drew in crayon concentric circles surrounding their bugs. The crayon resisted the water color paint that the kindergarteners placed over top of the crayon circles and created the effect of ripples on water. 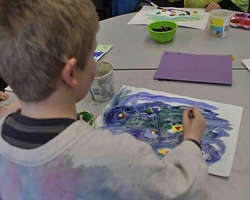 First graders study the work of Leonardo Da Vinci focusing on one of his most famous works, the Mona Lisa. The first graders talked about how Leonardo's portrait of the Mona Lisa told about what Mona Lisa might have been like in real life. 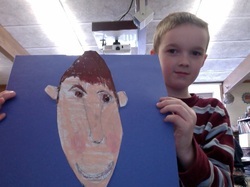 The first graders then concentrated on drawing and coloring a self-portrait. 4th graders studied the painting "School of Athens" by Raphael. They learned how Raphael used perspective to create the illusion of space. The 4th graders then created a landscape painting using a vanishing point to give the fields the appearance of receding back into space. After taking a virtual tour of the Florence Baptistery paying special attention to the bronze doors designed by the artist Ghiberti 5th graders produced foil reliefs using puffy paints, tin foil, and permanent markers. 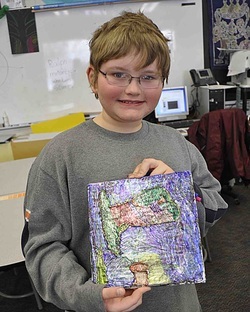 The fifth grade class spent one class period working on gesture drawings of fellow students. 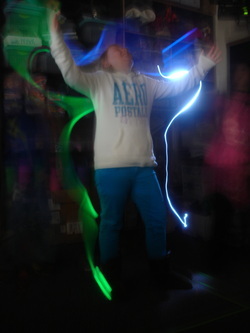 The next class period the 5th graders used their knowledge of gesture drawing to create gestural light paintings. 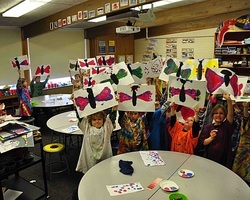 Before creating their butterfly paintings the 1st graders explored symmetry through a co-operative classroom project. Each student was given a shape. The students worked together to arrange their shapes symmetrically along a center line taped to the floor. After completing their classroom symmetry project the students began working on drawing and painting their butterflies.